The late summer can be a time when certain insects become more pests of humans than of plants! This can happen at the time we are using our gardens most for socialising and outdoor living. Harrod Horticultural provides you with safe and natural solutions for keeping these nuisance pests under control. Ants are not really pests of plants but can ruin the garden environment if present in high numbers. Their nests or ant mounds in lawns make lawn mowing difficult and make an un-pleasant area for children, especially if they are in bare feet. Ants will also choose patio areas as nest sites and can appear in high numbers under and on them. There are several safe ways of treating ants without the use of persistent and long lasting poisons. For lawn areas; try using nematodes against ants. These tiny microscopic worms can be used safely on lawns without damaging the grass or harming anyone using the lawn. 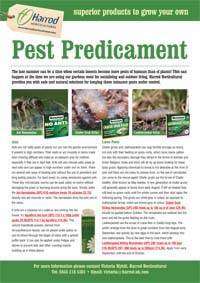 Simply water the Ant nematodes (GPC-010 medium treats 16 colonies £9.75) directly into ant mounds or nests. The nematodes drive the ants out of the nests. If ants are a nuisance on a patio or are coming into the house, try Agrothrin Ant dust (GPC-113 2 x 100g puffer packs £9.95/GPC-114 1 kg Agrothrin £14.95). This natural insecticide powder, derived from chrysanthemum leaves, can be placed under patios or can be blown through the edges of slabs with a special puffer pack. It can also be applied under fridges and stoves to prevent ants and other crawling insects building up in these places. Chafer grubs and Leatherjackets can reap terrible damage on lawns, not only with their feeding on grass roots, which turns lawns yellow but also the secondary damage they attract in the forms of animals and birds! Badgers, foxes and birds will all rip up lawns looking for these tasty grubs. Applying chemicals to lawns is not desirable at this time of year and there are not many to choose from, so the use of nematodes can come to the rescue again! Chafer grubs are the larvae of Chafer beetles, often known as May beetles. A new generation of chafer grubs will generally appear in lawns from early August, if left un-treated they will feed on grass roots until the winter comes and then start again the following spring. The grubs are white-grey in colour, as opposed to leatherjacket larvae, which are brown-grey in colour. 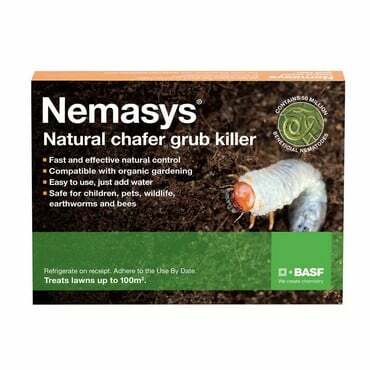 Chafer grub killing nematodes (GPC-290 treats up to 100 sq m of lawn £29.95) should be applied before October. The nematodes are watered into the lawn and kill the grubs feeding on the roots. Leatherjackets are the larvae of crane flies or Daddy-long-legs. The adults emerge from the lawn in great numbers from late August-early September and quickly lay new eggs in the lawn, which develop into new leatherjackets. 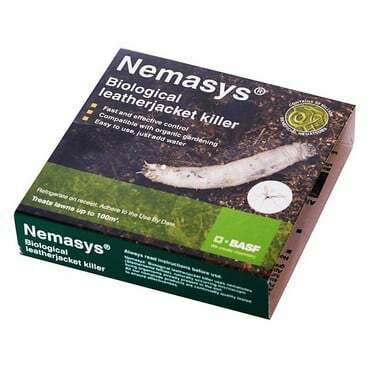 This is the best time to treat them with Leatherjacket killing nematodes (GPC-285 treats up to 100 sqm £16.95/GPC-287- 500 treats up to 500sqm £74.95)). Apply from early September until the end of October.